Marfy 4009 is one of the designs from the 2016-17 Marfy catalog. 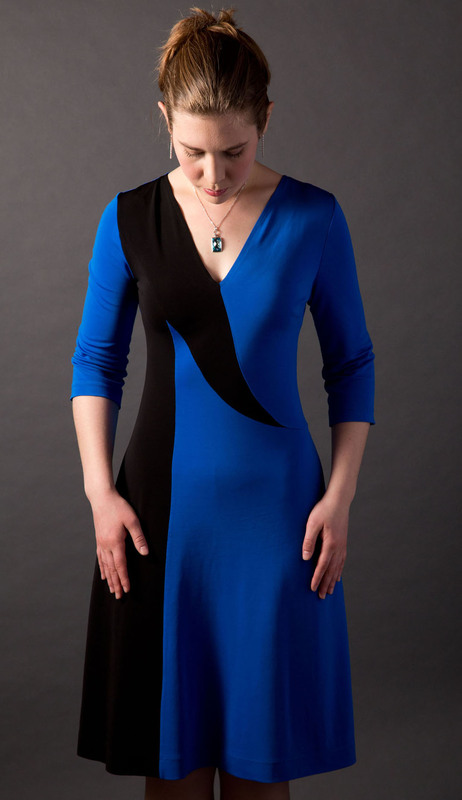 It is described in the catalog as “slimming dress with sculpted seams. To be made in soft cotton or jersey.” As you can see from the fashion illustration there’s cap sleeve and three-quarter length sleeve options. The blue fabric is a royal blue rayon matte jersey I bought from Mood a couple of years ago. It wasn’t stretchy enough for what I originally bought it for, but it worked out well for this particular project. The black fabric a matte jersey from Gorgeous Fabrics. Originally I had planned on lining this dress using a 40 denier nylon tricot. That didn’t work out too well. The matte jersey has a very heavy drape with a slight 4-way stretch, and the nylon tricot is extremely lightweight with just a 2-way mechanical stretch. After I attached the lining and tried on the dress I realized that this difference in drape and stretch resulted in the seams of the lining not lining up with the seams of the dress. I ended up removing the lining. I had planned on finishing the neckline with facings. That also didn’t work out as I expected. Since the facings were interfaced (ie non-stretch) and the dress was not, the facings ended up rolling out despite understitching and pressing. I ended up taking them out and finished the neckline by fusing some Design Plus straight superfine stay tape around the neckline just outside of the seam allowance. Then I folded over pressed the seam allowances in place before topstitching with a straight stitch 1/4″ away from the edge. I ended up removing the zipper I added to the center back seam for two reasons. The first is because it turns out it wasn’t necessary – I could wiggle in and out of this dress without it. The second reason is because it interfered with the drape of my fabric. Remember how I said my matte jersey has a very heavy drape, with a slight 4-way stretch? Well, what happened was the fabric was slightly stretching lengthwise everywhere except where the zipper was inserted. It ended up making diagonal wrinkles from the center back to the side seams. The wrinkles all but went away after I removed the zipper. I didn’t want to get too crazy taking in the waist of this dress, as the matte jersey fabric is not nearly as forgiving as ponte. Beautiful pattern (one of my favourites from this year’s catalogue) and you have done a beautiful job of making it in just the right fabric. Congratulations! Another gorgeous Marfy. You have fitted it to perfection! Excellent sewing, love your dress!! I’m curious to know how you went with getting the curve of the right side of the bodice so exact – it obviously looks perfect but how much work went into that? No more work than any other seams. Just a matter of aligning the notches and pressing each seam before sewing the next. With the front seaming you start from the bottom and work your way up to the top. I sewed the front seaming/shoulder seams/set in the sleeves with my serger, and everything else on my regular sewing machine. Looks fabulous Anne…love that your pendant works so well with it! Love that pendant! It works so well with so many outfits. Very pretty on you! It fits like a glove and I love all the seam lines. Thanks Amanda! It is an unusual look, isn’t it? Lovely fitting dress. Excellent job with this challenging pattern. It actually isn’t that challenging, IMO. It is easy to piece the front together if you start from the bottom up, and the rest is just a basic dress. That is absolutely stunning! I love the colour blocking on your last two dresses. Very chic. Love this dress. And I admire all your fitting techniques on your clothes – you always fit them to perfection!!! Adding (up to 3/4″) width to the bicep is a fitting alteration you often do. I’m curios to know what technique you use to do this alteration (do you only change the sleeve or also the armhole? ).